most efficient method of managing the situation. 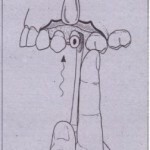 Preoperative radio graphs must be carefully evaluated for the tooth-sinus relationship whenever maxillary molars are to be extracted. 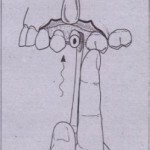 If the sinus floor seems to be very close to the tooth roots and the tooth roots are widely divergent, the surgeon should avoid a closed forceps extraction and perform a surgical removal with sectioning of tooth roots (see Fig. 11-8). 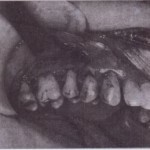 Large amounts of force should be avoided in the removal of such maxillary molars (Box 11-8). that a communication between the sinus and mouth exists. If a small amount of bone or no bone adheres to the molars, a communication may exist anyway. To confirm the presence of a communication, the best technique. is to use the nose-blowing test. Pinching the. 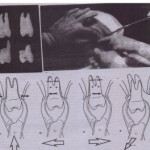 nostrils together occludes the patient’s nose, and the patient is asked to blow gently through the nose while the surgeon observes t he area of the tooth extraction. If a communication exists, there will be passage of air through the . tooth socket and bubbling of blood in the socket area. 1. 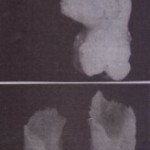 Conduct thorough preoperative radio graphic examination. .
2. lJie surgical extraction early and section roots. After the diagnosis of oroantral communication has been established, the surgeon must determine the approximate size of the communication, because the treatment will depend on the size of the opening. If the communication is small (2 mm in diameter or less), no additional surgical treatment is necessary. The surgeon should take measures to’ ensure the formation of a high-quality blood clot in the socket and then advise the patient-to take sinus precautions to prevent dislodgment of the blood clot. maintain piece of oxidized cellulose in tooth socket. The -majority of oroantral communications treated in the methods just recommended will heal, uneventfully. Patients should be followed up carefully for several weeks to ensure that this has occurred. Even patients who return within a few’ days with a small communication usually heal spontaneously if no maxillary sinusitis exists. These patients should be followed up closely and referred to an oral and maxillofacial surgeon if the communication persists for longer than 2 weeks. Closure of oroantral fistulae is important because air, water, food, and bacteria go from the oral cavity into the sinus” often causing a chronic sinusitis condition. Additionally, if the patient i~ wearing a full maxillary denture, suction is not as strong; therefore retention of the denture is compromised.